PM Netanyahu, Moshe Holtzberg, leave Israel for India on Saturday night. In a Saturday night statement, Netanyahu said, "With this visit, I intend to strengthen the relations between our countries even more. This visit is an opportunity to work strengthen cooperation with a world leader in the fields of economy, security, technology, and tourism. Indian Prime Minister Modi is a close friend of Israel and of me personally, and I appreciate the fact that he himself will accompany during large portions of the trip." Netanyahu will meet with Modi, Indian President Ram Nath Kovind, and Indian Foreign Minister Sushma Swaraj. Professional meetings will be held, and agreements will be signed. 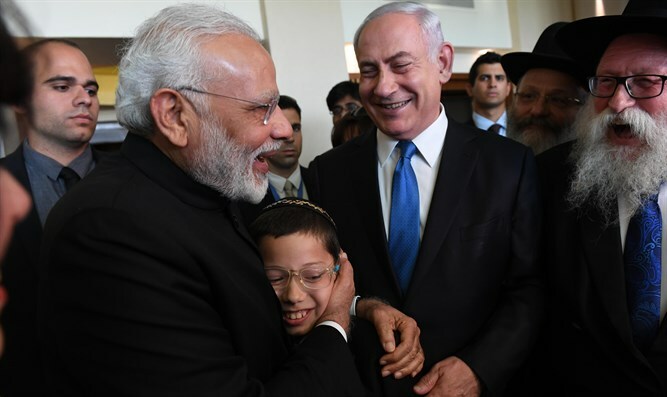 Netanyahu's entourage will be the largest ever to accompany an Israeli prime minister on an official visit, and its aim is to deepen and strengthen Israel's economic ties with India and to create joint business opportunities between Israeli and Indian businessmen. The Prime Minister will meet India's most senior businessmen, and will hold additional economic events together with Modi and a forum of CEOs of large companies both in Israel and India. Together with Modi, Netanyahu will participate in the second annual Raisina conference on geopolitics and geo-economics. He will also meet the leaders of India's Jewish community, as well as the heads of India's cinematography industry. Netanyahu and his wife will also visit the grave of Mahatma Gandhi, and participate in ceremonies marking the terror attack on the Taj Palace and the Chabad House in Mumbai. Bilateral agreements on energy, cyber, and aviation will be signed, and the leaders are expected to discuss a detailed working plan for the next five years, in accordance with the government's decision to strengthen the countries' ties.